Standing tall like a giant sunflower in a sea of undulating prairie grasses...or in any rural setting...a windmill is a thing of beauty. Not only are windmills a joy to watch, but they are incredibly useful. Powered only by wind, they work perpetually, like quietly-purring non-polluting creatures, to keep our storage tanks overflowing with fresh water. They operate effortlessly, efficiently, reliably...and free! Windmills have been around for two thousand years. The first recorded evidence of windmills being used for pumping water and grinding grain were in 7 AD in Persia. Then China got hold of the idea and it spread to Asia, Africa, and the Mediterranean. Because the design is so different, the European mill appears to have developed independently from the others. The predecessor to our modern windmill dates back to France in 1105 and England in 1180. In the 14th century, the Dutch took windmills to a whole new level with their tower mills that used canvas sails stretched across four wooden lattice frames (like a big X). Their objective was moving enormous amounts of water into higher basins and canals. By the end of the 16th century thousands of windmills were pumping and grinding in western Europe. By the late 19th century, the count was 30,000...yet, miraculously, there was still enough wind to go around! 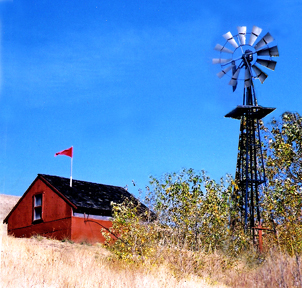 The American multi-bladed windmill bears little resemblance to its European counterpart. Unlike the Dutch scoop mills that could move 16,000 gallons an hour but lift it only 16 feet, the new Yankee design could lift water from hundreds of feet below the surface. It was invented in Connecticut in 1854 by a young mechanic named Daniel Halladay. Its wheel, made from wooden sails, could be transported in sections and assembled on location. Halladay sold thousands of his machines, and before long there were 300 competing manufacturers producing similar wooden-bladed beauties. Then in 1886, Thomas Perry designed the more aerodynamic steel-bladed windmill with curved blades (to catch more wind), and that design is still used today. 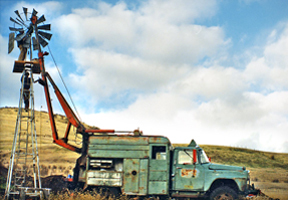 In the late 1880's and early 1900's, windmills were sprinkled all over the American landscape. They were indispensable to the late-comer settlers, who were forced to move farther west to the sun-parched remote plains after all the more desirable spots near rivers and streams had been taken. In the Great Plains and the vast territory known as the Great American Desert, water was more precious than gold. Windmills were also indispensable during the construction of the railroads, to provide drinking water for the crews and boiler water for the steam locomotives. Workers erected a windmill and an adjacent storage tank every 3 miles along the tracks. Some of the biggest railroad mills were 30-feet or more in diameter! That entire chapter of history is written in the wind...the wind that powered those windmills. There would have been no life, hence no progress, without water. Windmills were once status symbols. In 1910, a farmer or rancher who could afford the best Sears & Roebuck "Kenwood Back-Geared Galvanized Steel Pumping Model" with red-painted tips on the vanes and tail ($25) had something to crow about. 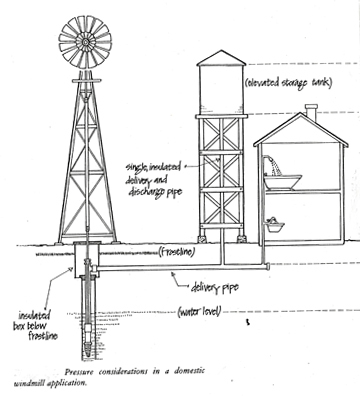 Poorer homesteaders had to make their own mill heads and towers out of wood. The windmill, barbed wire, and the six-shooter were the big three technological advances in those days. 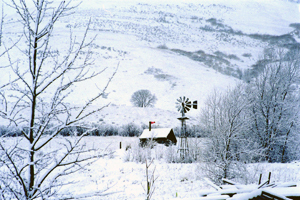 The great windmill boom lasted for over 50 years. 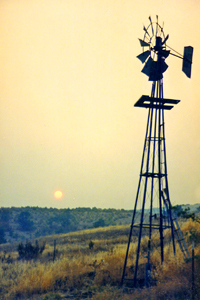 Between 1880 and 1935 more than 6 million windmills were sold by about 20 manufacturers. But sadly the big spinning wheels came to a screeching halt in the early thirties with the advent of federally subsidized power to remote farms and homesteads. 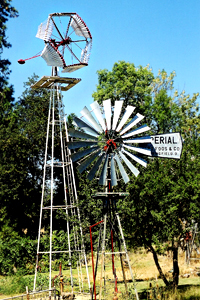 The REA (Rural Electrification Administration) made it possible for people to use electric pumps delivering 20-30 gallons of water a minute, and that drowned out the windmill era. 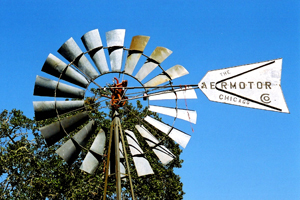 By 1970, only three companies in the US produced windmills: Aermotor, Dempster, and Baker Monitor. They are still in business today. Windmills in rural America were once as plentiful as barns and silos. Some of their skeletons are still standing as nostalgic monuments to a bygone era that could be called "Gone With The Wind." Hey, that would make a good movie! 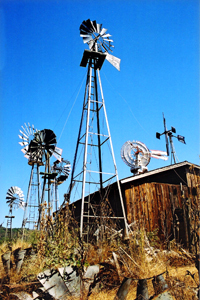 The windmill's wheel (fan) has 15 to 40 galvanized-steel blades that spin around on a shaft. 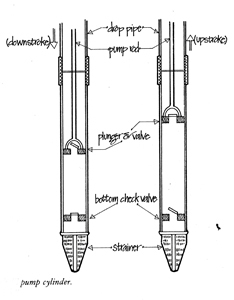 The shaft drives a geared mechanism that converts rotary motion to an up-and-down motion like a piston in a car engine. That motion drives a long pump-rod (aka sucker-rod) up and down inside a pipe in the well. 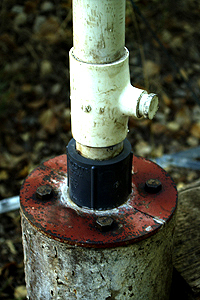 Attached to the submerged end of the pipe is a cylinder with a sealed plunger going up and down in it. (The seals are called "leathers".) Each up-stroke pulls water into the cylinder, but on the down-stroke a check valve (aka foot valve) in the bottom won't let it be pushed out, so the water has nowhere to go but up (with the next upstroke). It's a simple, efficient design that has remained virtually unchanged for more than a hundred years. An average windmill (6-8 ft. dia. wheel) spinning in a brisk breeze (15-20 mph) will pump about 3 gallons a minute whenever the winds blows, which is about 35% of the time in many areas. That adds up to about 1500 gallons a day. 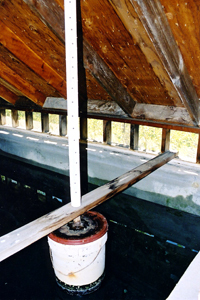 Another example of output could be calculated by using a 10-12 foot wheel pumping against a theoretical 100-foot head (the column of water lifted from the static water level in the well to the tank). This larger windmill will pump an annual average of 4500 gallons per day, or 1.63 million gallons of water a year. This figure is based on moderate winds (8-12 mph) blowing part of the time, running the mill at half its rated capacity, and brisk winds (15-25 mph) blowing about 30% of the year and running the pump at maximum capacity. Wind speed has an important effect on pumping capacity. Below certain speeds, the mill can't get going. Above 25-35 mph (depending on the model), the windmill's overspeed controls limit the output by turning (furling) the direct face of the wheel out of the main wind direction. This design feature protects the windmill mechanism, but it also limits the pumping rate no matter how fast the wind blows. 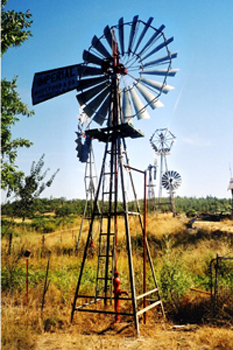 The most common practical uses for a windmill are to irrigate pastures and gardens, water livestock, and supply and aerate ponds. 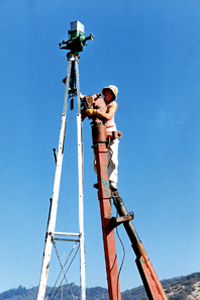 Anything more than that requires a holding tank on stilts or a water tower, to provide enough pressure for water to be on tap for household use. (See illustration.) I placed my water system on top of a hill so the water is gravity-fed for all my needs on the property. (More about my system later.) I love the idea that if the power fails, I'll still have fresh water...lots of fresh water. To me, that's self-sufficiency and a nice sense of security. Evidently a lot of country folks feel that way because windmills are making a comeback. Aermotor claims that sales of windmills are increasing worldwide, and more windmills are pumping water today than at the turn of the century. Because of the varied needs of diverse populations, there will always be a demand for alternative energy. OPEC is mighty powerful, but it can't control the sun or the wind! Is A Windmill For You? 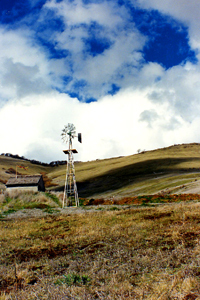 If you are contemplating putting up a windmill on your property, the first consideration is to determine whether your site and your budget can accommodate one. Then scout out the best location for it. A basic rule of thumb is to place your windmill a minimum of 25' above any obstructions (such as trees) within a 150' radius of the mill. And keep in mind that, by law, a well must be at least 100 feet from a septic system. Next, set up an anemometer or wind odometer to measure wind speed, volume, and direction over a period of time (a year is good). You can buy or rent a wind odometer that will measure the number of miles of wind that runs past your site. Divide that figure by the total hours it ran and you will get your average wind speed for the site. You can also call the local airport and weather station for comprehensive wind data in your area. First you'll need to obtain a permit from the local county offices. 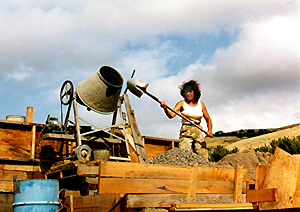 Next, call a good reputable well-driller (from the Yellow Pages under wells and pumps, or by word of mouth) and see what he can do for you. If he predicts the water is somewhere else on your property other than the site you picked, you'll have to do some compromising. 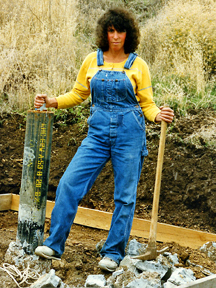 The going rate to have a well drilled is about $15/foot here in southern Oregon (surprisingly the same cost as back in 1981 when I had my two wells drilled!) That figure includes the steel well casing installed in 10-50 foot lengths (depending on your soil) and possibly a well liner all the way down (4"- 6" dia. PVC pipe). Some soil stratification requires a well liner to keep the fractured strata from caving in on the well. 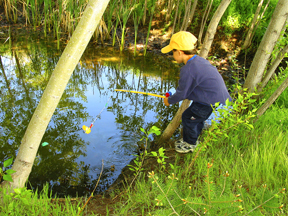 Chances are you'll hit a good water table between 100 and 400 feet, the average depth being 250'. Figure a well will cost you somewhere between $1500 and $6000. Of course there are no guarantees. These are just average ballpark figures I gleaned from well drillers around this dry and spotty valley. The good news is that you won't have to drill to China in search of huge volumes of water because a windmill can only pump a few gallons a minute. 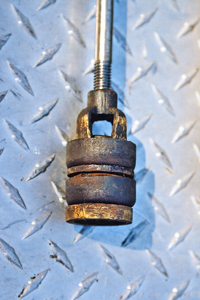 You can tell your well driller in advance to stop drilling when he reaches a depth that fulfills your limited requirement. Even a 5 gpm (gallon-per-minute) well would be sufficient for a small windmill. Because the refreshment rate would be greater than the pump rate, there would be very little, if any, drawdown. 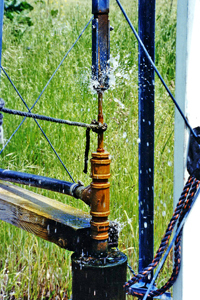 Drawdown is the measurement of the static water level going down, down, down, as water is being used out of the well. Any well, with a windmill on it or not, is constantly being replenished (static water level going up, up, up) from the water table underground. 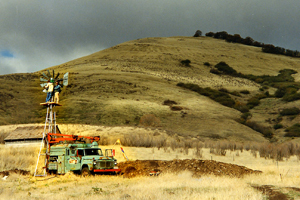 There are two distinctly different methods of drilling a well: One is the rotary method, where an big auger on a boom truck drills a deep, clean hole...not unlike a drill bit in a hand drill...and hits water when it gets to a water-bearing layer (aka water table). The other method is called cable drilling and basically hammers a hole through rock and other strata, fracturing everything in its path, and causing each layer it goes through to release its water (if it has any). 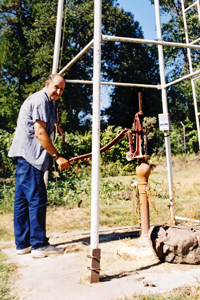 Proponents of this method claim they get more water all the way down than the conventional rotary method delivers. The geological debate can get downright steamy on this dry subject! Two of the many well drillers in the Medford area were kind enough to return my calls promptly and took the time to answer all my questions. They impressed me as being knowledgeable, experienced, and professional. 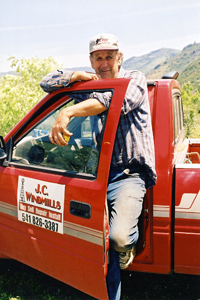 The rotary guy was Joaquin Medina of Medina Well Drilling Inc....a family business in Central Point, Or. 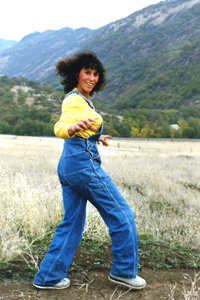 Phone (541)664-6339. 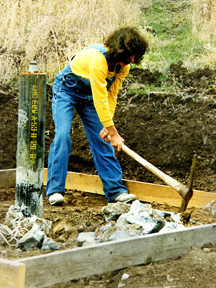 The cable guy was (no, not Jim Carrey) but Scott Coffman of Rogue Valley Drilling...a family business since 1896 in the midwest and since 1947 in southern Oregon. Phone (541)776-7944). They both give free estimates. After your well is drilled, cased, and capped with a well seal (and the water is tested to make sure it's safe), it's time to size the windmill that will fit your well and your needs. If you want a new windmill, contact the 3 major manufacturers (mentioned previously) and ask for brochures and pricelists and installation fees. If your budget decides that you must buy used, there are sources on the internet and ads in farm journals, etc. to help you find one. Thousands of good used ones are available all over the US. Do your research, and it will pay off. Keep in mind though, that most used windmills will need some rebuilding work. Parts are available for most models, and there is no problem getting parts for Aermotor, Dempster, and Baker Monitor. 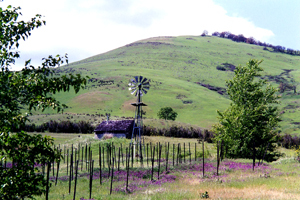 Here in the Rogue Valley (southern Oregon) there is a guy I call The Windmill Man (for obvious reasons). He is passionate about windmills and knows pert'near everything about every model ever made. He not only sells, installs, and repairs used windmills, but he also has a huge collection in his own yard! He's the real deal...an authentic craftsman who is trustworthy, knowledgeable, and skilled. If a windmill has a broken part that can't be found, he makes it. 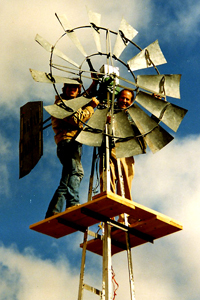 If a windmill system needs customizing or improvising, he does it. For years he has done the maintenance work on my 1942 David Bradley...an old Sears model I bought in 1982 for $450, and it's still going strong. 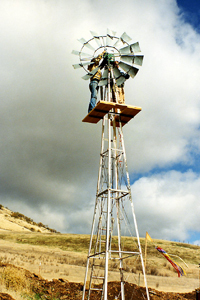 Maintenance on a windmill is minimal: Change the 10-weight oil or ATF (automatic transmission fluid) in the gears every year, put a little grease in the bearings in the turn-table (between the gearbox and the top of the tower) at the same time, and replace the "leathers" (cupped seals that ride up and down in the pump-cylinder) every 2-10 years (depending on how much sand you have in your water). Longer-lasting neoprene instead of leather is used in most cylinders today. The stuffing box (usually brass) has to be re-packed and the nut tightened occasionally. This curious-sounding component is a simple design and an easy-to-understand concept if you see it working, but hard to explain on paper. It's what caps off the top of the well-pipe (the cylinder pump caps off the bottom of the well-pipe). The pump rod goes up and down through a hole in the stuffing box (which is stuffed with graphite rope). This stuffing (aka packing) allows only enough water to leak out around the hole to lubricate the up-and-down action of the rod. 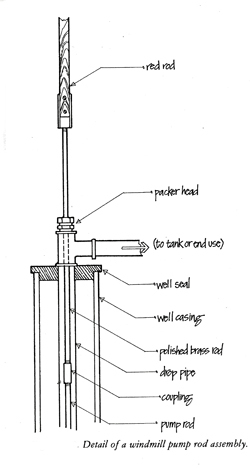 A stuffing box is needed on a windmill only if you have to pump water uphill to a tank, but not needed if your water will flow downhill to a storage tank or horizontally into a watering trough or pond. That just about sums up the maintenance on a windmill. My property is a hilly piece with the well down below and the water storage tank up above. There's a quarter mile of pipe and 165 feet-of-head (vertical rise) between the two. 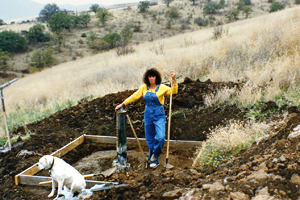 The well driller confidently predicted that my big water was at the bottom of the hill, so after the well was in, I had to dig a long trench to bury the water line all the way to the tank at the top of the hill. That gut-busting labor turned out to be a blessing in disguise because now gravity works in my favor. 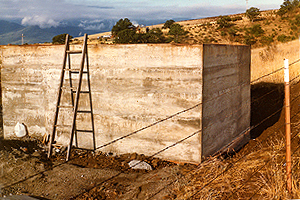 I built a 6,500-gallon water storage tank out of concrete (12'x12'x6'), put a roof on it and, for ventilation, screened the space between the tank and the rafters. Then, so I could check my water level at a glance from anywhere on the property, I put a brightly colored flag on a pole that goes up and down through a hole in the roof. The wooden pole and its PVC guide (sleeve) is set into a 5-gallon bucket of air with a gasketed lid on it. The bucket floats on the water level. The pole could be calibrated, but that would require getting the binoculars out to read it, so just plain high and low are good enough for me. When the flag is dancing in the breeze three feet above the roof, the water tank is full...and I'm happy. I built the holding tank to eliminate the need for a captive-air tank in the pump house (small steel water tank with an air bladder inside). The tank works on a pressure-gauge system that turns the submersible pump on and off constantly as the bladder compresses or expands (when the tank fills and empties). This action eventually wears out the pump's starting capacitor. With 10 thirsty acres to irrigate, the pump would have had to cycle on and off every few minutes all summer long. My stored water supply is gravity-distributed for irrigation and household use upon demand, via a maze of pipelines and on/off valves (non-siphoning type) that staggers even my imagination, and I'm the one who did it! As I developed the property over the years, I crisscrossed the land with thousands of feet of additional water lines as needed. I used inexpensive 3/4" util1ty polypipe (about 7 cents/ft.) for landscape irrigation and poked a hole or two with an ice pick wherever I planted a bush or tree. It's the poor man's answer to drip irrigation. This gravity-feed system and flag-pole alert has worked great for 20 years now. I'm so glad I bought a hill to live on! Gravity is free and gives me 70 lbs. of water pressure down below and 40 lbs. at the house (the halfway point on the hill), which is plenty. (Figure every 100 feet of head = 43 lbs. per sq.in. pressure). Because I use a drip irrigation system, even low pressure up near the tank works fine. Wind is free too, and I just happen to love windmills...the water pumping kind. These giant pinwheels are as beautiful to watch as they are practical, useful, and affordable. For long-range self-sufficiency and in case the power goes off, I put in a second well (low-capacity) adjacent to the holding tank and put a small windmill on it (6-foot dia. wheel). Whenever the wind blows, which is often, it pumps 2 GPM (gallons per minute) into the tank and supplements the water supply. 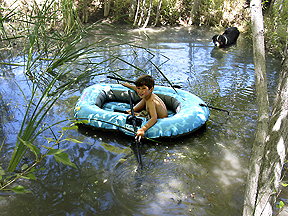 An overflow pipe exiting the top of the tank feeds a small pond that nature has generously stocked with frogs and mosquitos. The county vector control supplies free mosquito fish...hardy little critters that vacuum up mosquito larvae faster than they can hatch, so everything balances out. I planted hybrid poplars around the pond, and they grew huge in no time, so now I have a shady oasis to hide in from the summer sun while the dogs jump in the pond and cool off. Life on the hill is good. The windmill purrs and the frogs croak. Years ago I almost let a fast-talking salesman sucker me into buying an elaborate and expensive water-level gauge system of brass and copper ballcocks and levers floating in the tank (like a toilet-flushing mechanism) that would turn my pump on and off automatically when the water went above or below a certain level. "While you sit in your easy chair eating chocolates," he said. It sounded like a good idea (the chocolate part), but it would have required 1/4 mile of buried electrical cable and a complicated hook-up system. My water is high in calcium and other minerals, so every part would have already corroded beyond recognition and jammed up. Being economically challenged, I came up with a cheap solution and sent Mr. Bells and Whistles on his way. Instead of eating candy, I run down to turn the pump on and stay slim! My advice to new land owners is to think long and hard before buying gadgets that will eventually need repairs or replacement. Think long-range, think simplicity, think self-sufficiency. That's what the Backwoods Home philosophy is all about!